Françoisite-(Nd): Mineral information, data and localities. Named in 1988 by P. Piret, M. Deliens, and J. Piret-Meunier in honor of Dr. Armand François (Aljustrel, Portugal, December 28th 1922 - ), Belgian geologist and former director of the Geology Department of Gécamine, a Zaïrian mining company. 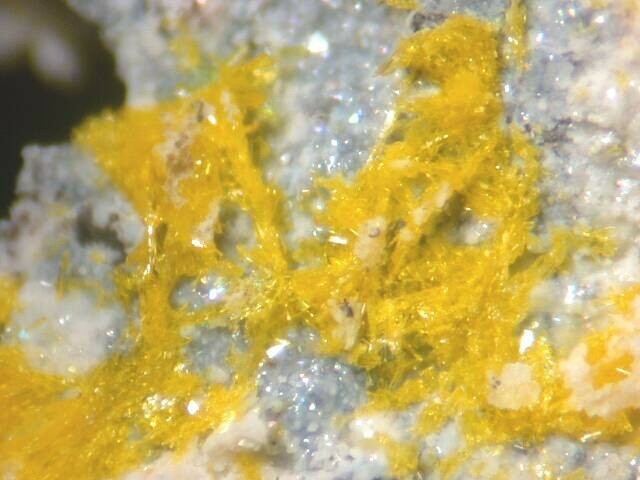 This page provides mineralogical data about Françoisite-(Nd). Françoisite-(Ce) 2 photos of Françoisite-(Nd) associated with Françoisite-(Ce) on mindat.org. Metatorbernite 1 photo of Françoisite-(Nd) associated with Metatorbernite on mindat.org. 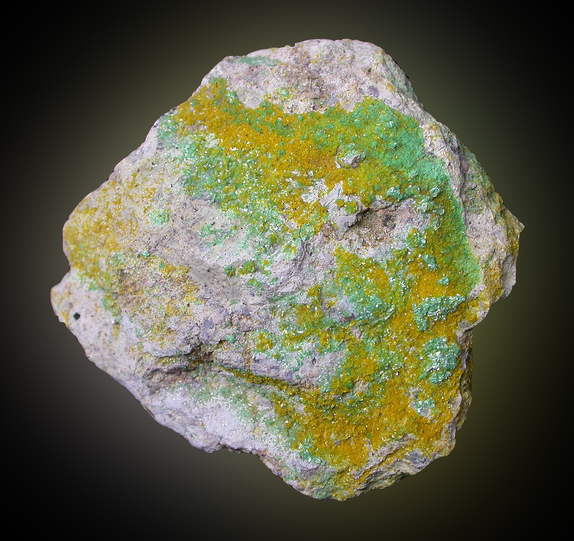 8.EC.05 Phuralumite Al2(UO2)3(PO4)3(OH)2 · 13H2O Mon. 8.EC.05 Upalite Al(UO2)3(PO4)2O(OH) · 7H2O Mon. 8.EC.10 Arsenuranylite Ca(UO2)4(AsO4)2(OH)4 · 6H2O Orth. 8.EC.15 Hügelite Pb2(UO2)3(AsO4)2O2 · 5H2O Mon. 8.EC.20 Vanmeersscheite U6+(UO2)3(PO4)2(OH)6 · 4H2O Orth. 8.EC.30 Mundite Al(UO2)3(PO4)2(OH)3 · 5.5H2O Orth. 8.EC.35 Phurcalite Ca2(UO2)3(PO4)2O2 · 7H2O Orth. Piret, P., Deliens, M., and Piret-Meunier, J. (1988) La françoisite-(Nd), nouveau phosphate d'uranyle et de terres rares; propriétés et structure cristalline. Bulletin de Mineralogie: 111: 443-449. MinMag 60:665; Jensen, K.A., Palenik, C.S., and Ewing, R.C. (2002) U 6+ phases in the weathering zone of the Bangombe U-deposit: observed and predicted mineralogy. Radiochim. Acta: 90: 761-769.; Janusz Janeczek (1999) Mineralogy and geochemistry of natural fission reactors in Gabon. Reviews in Mineralogy and Geochemistry, MSA, v. 38, p. 321-392; Janeczek, J., & Ewing, R. (1996). 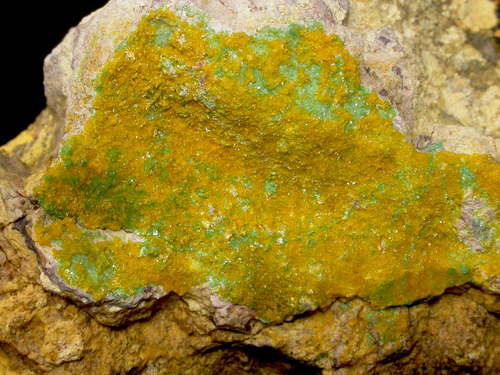 Phosphatian coffinite with rare earth elements and Ce-rich françoisite-(Nd) from sandstone beneath a natural fission reactor at Bangombé, Gabon. Mineralogical Magazine, 60(4), 665-669. In Philippe Roth's collection. XRD and SEM/EDX determination by N. Meisser (MGL Lausanne), February 2009.